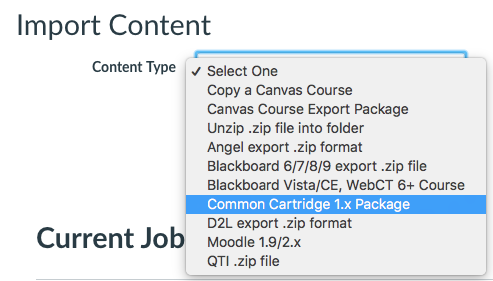 You can import Pressbooks content into different parts of Canvas depending on how you title and import your files. By default, chapters you import from Pressbooks into Canvas will appear as modules. If you would like your content to display as embedded text within a module, there is nothing more you need to do to prepare your text for export! If this is the case, proceed directly to Step 2. In order to incorporate Pressbooks chapters into Canvas, you will need to export your text in a format that Canvas can interpret. To do so, you will export your Pressbook as a “Common Cartridge” file. In this pane, you’ll see the option to check off two boxes: (1) use normal web links instead of LTI links, and (2) include links to parts. Leaving these boxes unchecked will allow you to import your content into Canvas in the most visually seamless manner. Click “Download Cartridge” without checking any boxes. What are LTI links, anyway? LTI links allow Canvas to embed content directly into a page. If you use normal web links instead of LTI links, you will see a frame around your Pressbooks content in Canvas and the media you incorporate into your chapters may not scroll as fluidly. 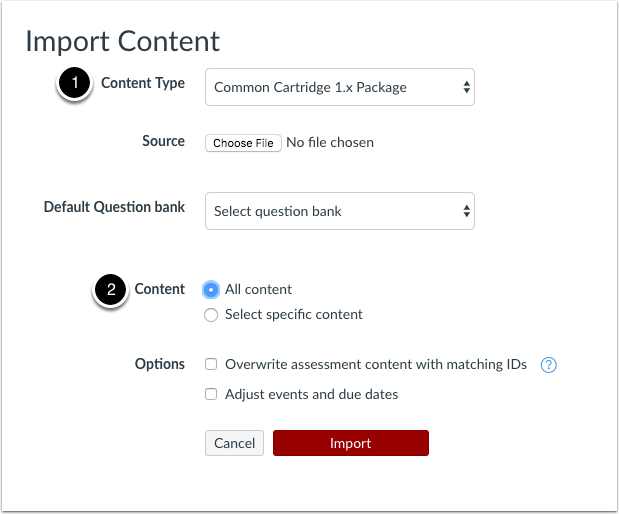 Under the “Content” selection pane–(labeled “2” in the Import Content screen above)–you can choose either to include all or part of your Pressbooks content. If you navigate to your Canvas “Modules” page, you will see each Pressbooks chapter listed as an unpublished module in Canvas. In the example above, the user has chosen to upload all of their Pressbooks content into Canvas. Each Pressbooks Part appears as a group of modules. Each Pressbooks Chapter appears as a module post. Once the user clicks on the “publish” option for each module object, the module posts (“Chapter Robot,” “Anchor Example Page,” etc.) will appear as embedded pages when the user clicks them. In this example, Canvas has recognized that the user has designated some Pressbooks chapters as assignments by including the preface “Assignment:” in their Pressbooks chapter title. In the example above, Canvas has successfully recognized that Pressbooks chapters whose titles begin with “Assignment:” are intended to fall into a different category than regular modules. These items have been converted into published assignments in the Canvas Modules page and an entry for this assignment should have also appeared in your Canvas assignments list and gradebook. 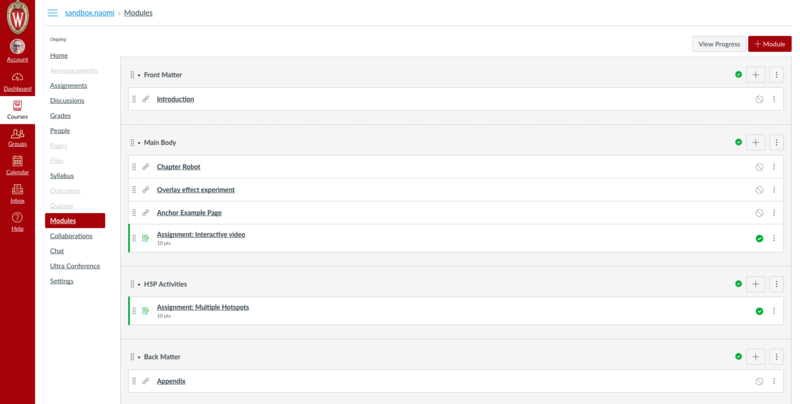 In a future post, we will discuss how to configure grade-reporting settings so that the scores from your H5P activities connect to your grade-book in ways that you wish them to be recorded.